Landing in and starting to live in a foreign country where one does not know the language or culture can be a rather stressful affair. Thankfully, my wife’s work has a program in her office where a co-worker is designated as the Work Sponsor to help the new arrival and family become acclimated to the area and to ensure a smooth (or, at the least, “relatively smooth”) transition to the new locale. Our Work Sponsors were the O’Ryans, Marcus and Elizabeth, and they took time out of their free Saturday to help us go shopping so that we could stock up our new house and to show us the ropes about how one shops in Lima. 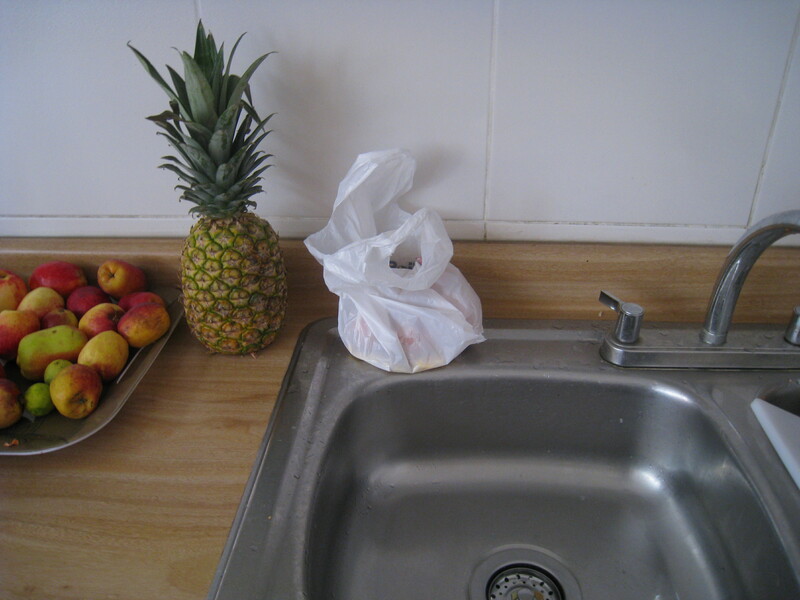 However, before that grand shopping adventure could commence, lunch was on the menu. Being an atypical American, I wanted to sample some food of a local flavor. Being a typical American, I didn’t want to stray too far from my edible comfort zone. Luckily, near the market we were going to visit was a happy compromise…Peruvian hamburgers courtesy of Bembos. 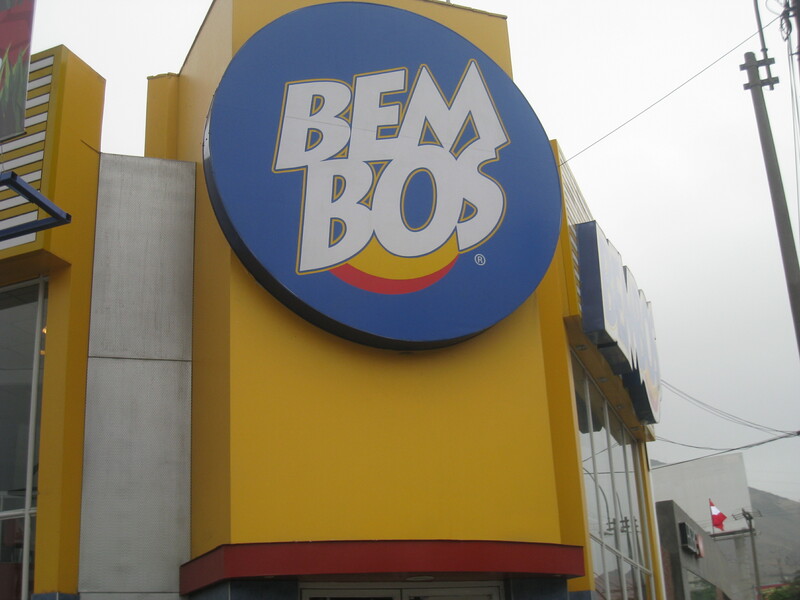 Bembos appears like any other fast-food hamburger establishment (brightly lit, menus above eye level, counters, staff wearing loud colors), but the selections are of a local flavor. The Mexican hamburger comes with tortilla chips between the buns. The Bembos Huachana contains eggs, potatoes, mayonnaise, huacho sausage, hamburger and lettuce. Yes, an egg. Poached, I believe. I went with the Bembos Criolla which has fried sliced ​​potatoes, Creole sauce, lettuce and mayonnaise. It was not my choice of burger that introduced me to a new taste sensation. Instead, it was a tiny packet of sauce that I took for my papas fritas (French fries) suggested to me by the O’Ryans. This type of sauce is called aji and it is a tangy, spicy, orange-colored sauce. It is more flavorful than ketchup and more robust than mustard, yet less spicy that jalapeno. This is exactly the type of new food flavor that I was looking for in this whole Peruvian adventure – and thankfully, it would not be the last. My other new find is Inca Kola…but my reaction to it can wait for another post. With lunch done, it was time to shop and our place to go was a local shopping market. Again, just like the thought I had when entering the terminal at Jorge Chavez International Airport, I wasn’t quite sure what I expected when I entered this suburban Lima grocery store, but it was similar to any Kroger’s, Ralph’s, Shopper’s Food Warehouse, or [insert your local supermarket here] to be found in the States. Bright, clean aisles filled with a wide variety of foodstuffs, cleaning products, and produce greeted us and the O’Ryans and us began our quest for all the things we would need for the house. Despite the similarities, I would like to point out one difference between this local shopping establishment and any up north in the Lower 48 (I can’t speak for Hawaii and Alaska). Back home, at Costco for example, people would give out samples (and anything with cheese on it was my favorite) but they would be standing behind a small counter. Here, the women (and they are all young women) would be standing in the aisles holding trays of their promoted products. They would come up to you and ask if you would like to sample their wares. Even when we were checking out, the Scotch-Brite woman kept asking us to feel her sponge. A further difference to mentally take note of is that these women are wearing an outfit that has the logo and color scheme of their advertised samples, which sort of made them look like tiny NASCAR drivers. We sent the kids at staggered intervals to the Splenda woman because my wife loves her coffee sweetener and free always tastes better. END NOTE: To finish off our dining experience for our first full day in Peru, we had dinner at Pizza Hut. Baby steps, people, baby steps. 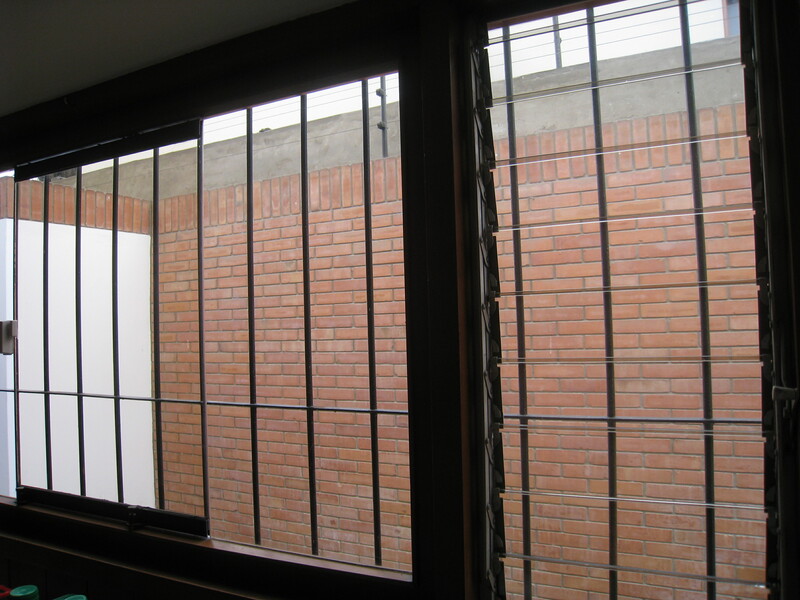 As promised at the end of this post (previously on Sin Polaris), here is the story of our first shower in Lima, Peru. When preparing to get our three children ready for their morning wash, I inspected the showers and using the little Spanish I do have at my command, I grabbed the knob labelled “C” and turned it clockwise. For you see, dear reader, I was using my smarts and I knew that “C” stood for caliente, which is Spanish for “hot”. A few minutes later, I was not feeling as smart as the water that issued forth from the shower nozzle was still as cold as a polar bear’s nose. ‘Twas only then that I noticed that the other knob in the shower in my boys’ bathroom was labelled “H”. Sigh! 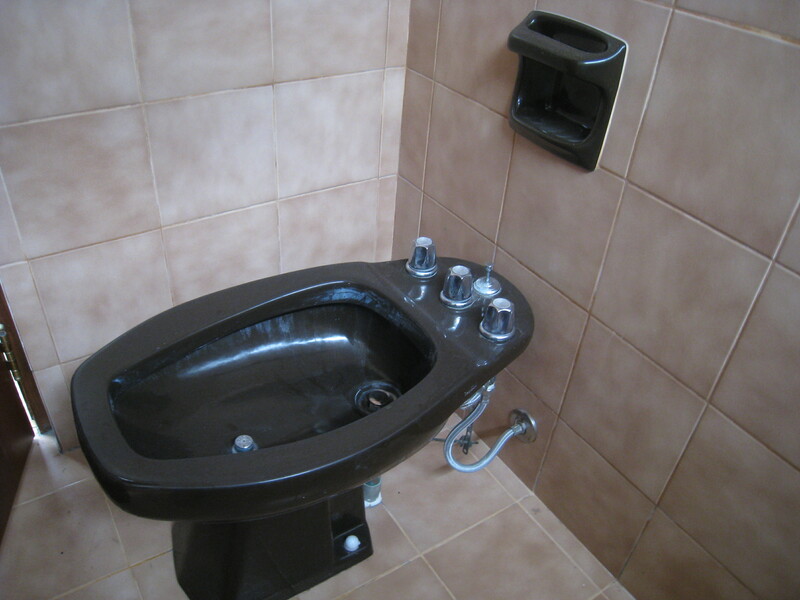 …still provided absolutely no hot water even after five minutes of wishing really hard to the Agua Fairy. Liquid of an Arctic origin was likewise only issuing forth from my daughter’s showerhead and all seemed destined for a frigid showery morning until we quickly discovered that the shower in the master bathroom provided water that registered above 20 degrees (and in honor of our host country, I am using the metric temperature scale named for Anders Celsius…for a conversion, go here). One shower…five people…this promised to be a long stay in Peru if this matter was not resolved soon. Sigh redux! 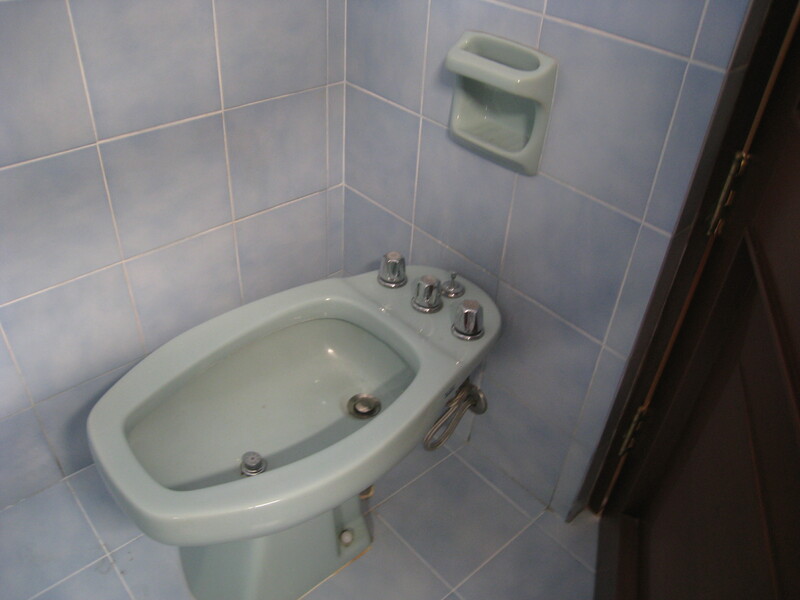 Since we are on the subjects of bathrooms and because I am an American living abroad, please let me be the 3,336,126th person to joke about the type of water closet hardware found in most parts of the world, but not in the USA…the bidet. 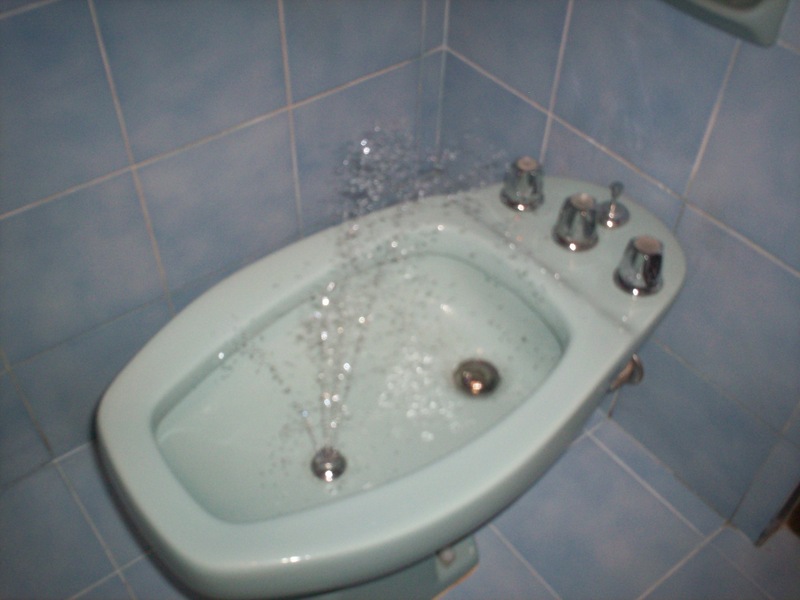 ...or perhaps a refreshing fountain. Trust me folks, the jokes don’t get any better. I can only surmise that our house was once owned by an evil genius (from SPECTRE or KAOS perhaps?) because it appears that our Lima abode is equipped with a self-destruct mechanism. As I have mentioned before (see Disclaimer No. 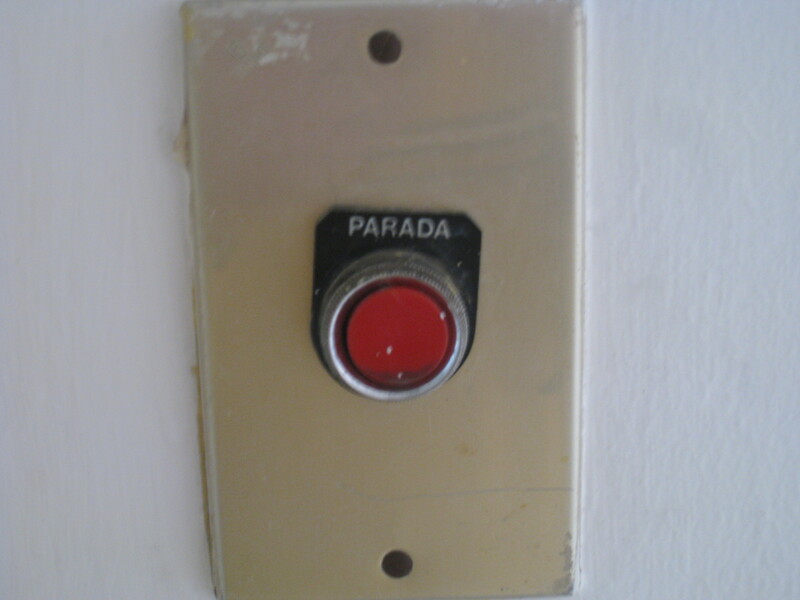 2), my Spanish is horrible, but my lovely wife (and backed up by Google Translate) told me that parada means “stop”. However, my next question is, “What am I stopping?” Does pushing this button stop the gas? the electricity? the phone? the water? a horde of stampeding capybaras? I am curious beyond despair to push this button and find out what happens…except, of course, that my fear of the unknown trumps my curiosity and so the button remains untouched. This is the same feeling I have when I think about attempting to communicate in Spanish with anyone else in the city. I realize I am in a place and a neighborhood that does not see many tourists. This means I cannot expect English to be spoken around here. When I vacationed in certain parts of Mexico that catered to tourists, I knew I could always expect some local vendor to speak English. It was a lifeline and I was happy for it. This is not the case here and I will have to deal with it. b) causing an international (or even semi-local) incident because I used a completely inappropriate and incorrect word. z) press the button and deal with the consequences. I’ll deal with the capybaras as they come. I have pushed the metaphorical button. So far, there has only been one humorous incident of a misplaced word (and of course I shall share it). I was at a store buying clothes for our children and I needed socks. I approached a clerk and asked, in my halting Spanish, “Tienes calzones?” The clerk looked at me a little askew and then took me over to the undergarments section, because I had used the word for “underwear”, when I meant to say calcetines. It’s a good thing I wasn’t looking for a comb. For those of you who know your Spanish, you know that there is only an accented syllable difference the word for “comb” and the word for…er, how to put this…the “male member” (ahem). The real button outside of our kitchen remains untouched. I am conquering my fears one at a time. After leaving the airport, we drive to our house through the heart of Lima. While my watch reads 22:30, my body clock, courtesy of the travel and stress, has reached its limit. While one of my wife’s co-workers is chatting about this street or that building or this tidbit of life in Lima, my mind is fuzzy. However, upon hearing the word “death”, the circuit breakers in my brain spark to life and ask the woman riding shotgun to repeat what she said. We were in a roundabout and she said that while the official name of this parcel of road is “Ovalo Monitor“, the unofficial name is “The Circle of Death”. With a circle of asphalt spanning four lanes and entry and exit points at the cardinal directions, the cars fly through this roundabout fast and furious…and there are no traffic signals so it becomes a free-for-all when the roads are full. As we drive through Ovalo Monitor late on a Friday night, the traffic is light and this seems more like a “Circle of Mild-Grade Fever” than its more morbid moniker. Once our mini-van arrives in a month or two, I know I will be forced into this roundabout soon to drive around Lima on various errands and we’ll see if the nickname lives up to the hype. Until then, I am content to let someone else do the driving because there is a house I have never viewed, a bed I have never seen, and a fuzzy future I can dimly view all waiting for me. A seasoned world traveller I met at a lunch last week told me that every major city has its version of the “Circle of Death” and that Lima’s version in the Monterrico neighborhood is nothing out of the ordinary. I have it on my “List of Things to Research” to find out who is the Monitor this roundabout is named for. For the time being, I have only been driven through Ovalo Monitor in taxi cabs by drivers who either have nerves of ice water or an extrasensory perception of what all the other drivers on this road because for all the chaos and confusion of cars speeding by and weaving through each other, I still have yet to see an accident.